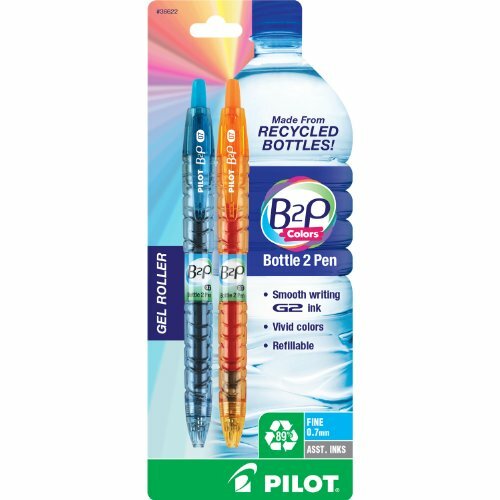 With the B2P, from Bottle 2 Pen Gel Roller, Pilot has launched the world's first pen made from recycled bottles! In recent years, plastic water bottles have been under close scrutiny for their environmentally unfriendly characteristics. Almost every hour, close to 250,000 plastic bottles enter landfills and comprise close to 50 percent of all recyclable waste. Mae from 89 percent post-consumer recycled plastic bottles, the Pilot B2P features vibrant gel ink and a fine 0.7mm point for smooth, effortless writing. Designed to mimic a bottle of water, the body of the B2P pen is translucent blue with unique striations like those commonly found on water bottles. Retractable and refillable, the B2P uses the same ink refill as the Pilot G2, America's number one selling gel pen. Available in blue, black, and red ink, the writing quality of the B2P meets the same high performance standards found in all of Pilot Pen's products. Pilot Pens. Simply write. 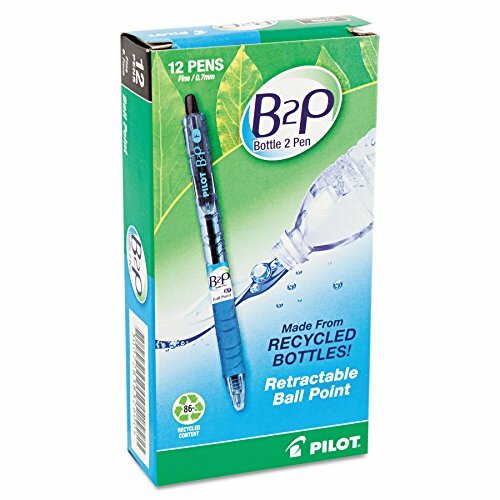 With the B2P, the Bottle 2 Pen Ball Point, Pilot has launched the world's first pen made from recycled bottles! In recent years, plastic water bottles have been under close scrutiny for their environmentally unfriendly characteristics. Almost every hour, close to 250,000 plastic bottles enter landfills and comprise close to 50 percent of all recyclable waste. 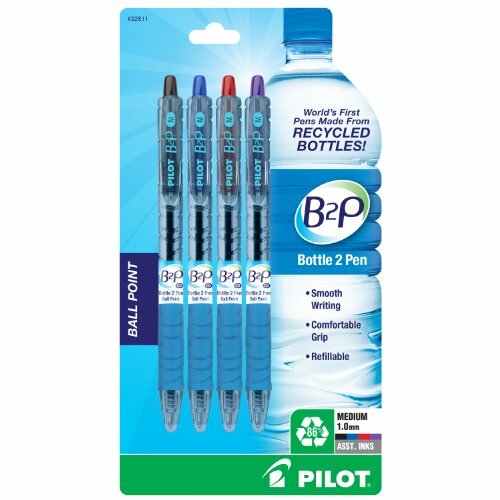 Made from 86 percent post-consumer recycled plastic bottles, the Pilot B2P features smear-proof ball point ink and a medium 1.0mm point for smooth, effortless writing. Designed to mimic a bottle of water, the body of the B2P pen is translucent blue with unique striations like those commonly found on water bottles. Each pen has a comfortable, latex-free rubber grip for easy holding and use. Retractable and refillable, the B2P Bottle 2 Pen Ball Point takes Pilot retractable ballpoint refills. Available in blue, black, red, green and purple ink, the writing quality of the B2P meets the same high performance standards found in all of Pilot Pen's products. Pilot Pens. Simply write. 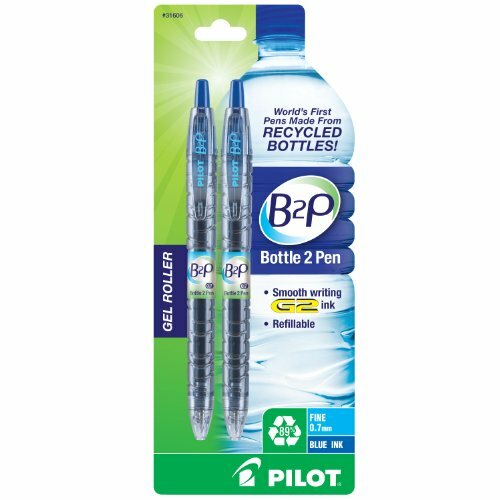 With the B2P, from Bottle 2 Pen Gel Roller, Pilot has launched the world's first pen made from recycled bottles! In recent years, plastic water bottles have been under close scrutiny for their environmentally unfriendly characteristics. Almost every hour, close to 250,000 plastic bottles enter landfills and comprise close to 50 percent of all recyclable waste. Mae from 89 percent post-consumer recycled plastic bottles, the Pilot B2P Colors features vibrant gel ink and a fine 0.7mm point for smooth, effortless writing. Designed to mimic a bottle of water, the body of the B2P Colors Pen is translucent to match the ink color with unique striations like those commonly found on water bottles. Retractable and refillable, the B2P uses the same ink refill as the Pilot G2, America's number one selling gel pen. Available in a variety of bold colors and barrels, the writing quality of the B2P meets the same high performance standards found in all of Pilot Pen's products. Pilot Pens. Simply write. Pilot G2 Pen With Refills, 0.7mm Fine Point Black Gel Ink. Deal includes: 2 Pilot 31020 0.7mm black gel ink pens, 1 Pilot 31600 0.7mm B2P Gel Ink Pen and 6 packs of 77240 G2 0.7mm black fine refills with two refills per pack. 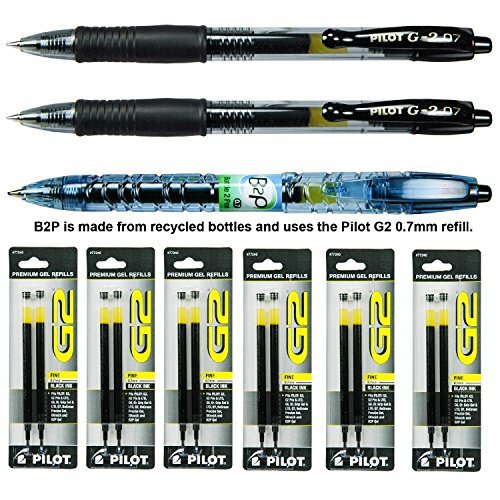 The Pilot B2P is made from 89% post-consumer recycled plastic bottles and uses Pilot G2 refills. 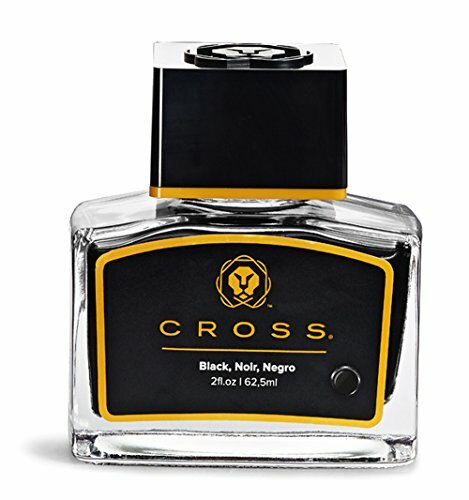 Cross fountain pen ink comes in an elegantly designed glass bottle with a custom cap design embossed with the new Cross lion icon. 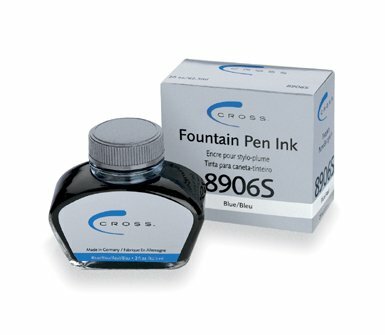 Our exclusive formula provides both superior writing characteristics and complete chemical compatibility with our fine writing instruments. Bottle contains 62.5 ml (2 oz.) of ink. 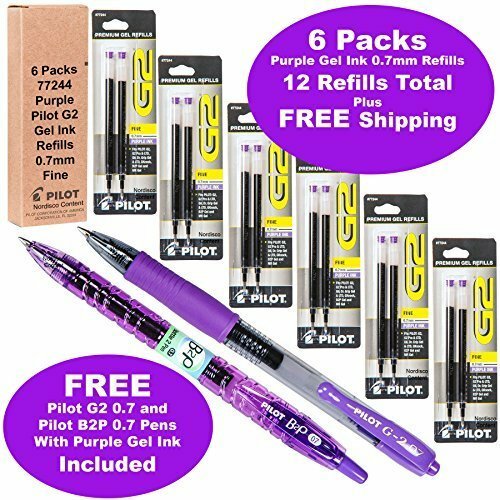 Deal includes 6 packs Pilot G2 Purple Gel Ink refills with 2 refills per pack plus 1 Pilot G2 0.7 Fine Pen with Purple ink and 1 Pilot B2P 0.7 Fine Pen with Purple Ink. 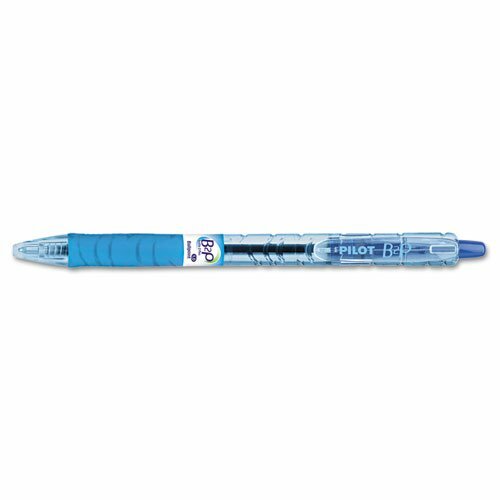 Review of the Pilot B2P Bottle 2 Pen Retractable Roller Ball Pen - fine point, 0.7 mm. Another first for Pilot. A retractable, refillable gel ink rollerball which is made from recycled plastic bottles and designed to look like one too. Chunky translucent barrel is sculpted like a mineral water bottle. 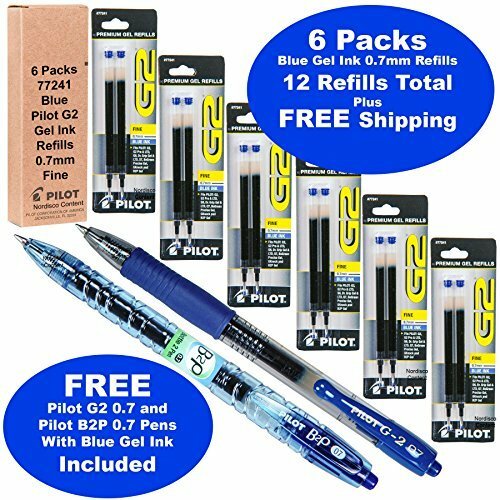 Compare prices on Bottle 2 Pen Refill at ShoppinGent.com – use promo codes and coupons for best offers and deals. Start smart buying with ShoppinGent.com right now and choose your golden price on every purchase.